1964	●	Darryl McDaniels	→	Run-D.M.C. 1955	●	Edwin “Eddie” Jobson	→	Jethro Tull, Roxy Music, U.K. 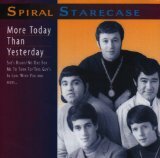 Album of the Day: Spiral Starecase (5/19/69) 41 Years!